Engineers India Limited (EIL) Diploma Trainee recruitment 2012 notification came out two week back for 25 Diploma Trainees (15 Trainee Draftsman & 10 Trainee Supervisor) These positions are for freshers. 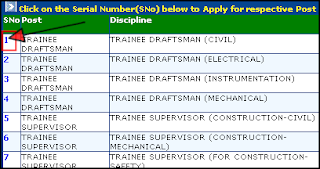 As per the notification, last date to apply for these EIL Diploma Trainee positions is 6th July, 2012. You can Click here to download the EIL Diploma Trainee Recruitment 2012 Notification. This blog post tries to highlight the notification with summary of salient points to help you apply for the same. But before that let us know EIL as an organisation. Set up in 1965 to help the vital petroleum industry in the country, EIL (Engineers India Limited) is a major construction engineering and consulting PSU in India. Over the years it has diversified into highways and bridges, ports & airports, mass rapid transport systems etc. Based in New Delhi, EIL has a branch office at Mumbai, a zonal office at Kolkata, regional offices at Chennai and Vadodara and inspection offices at all major equipment manufacturing locations in India. It also has overseas offices at London, Abu Dhabi, Nigeria, South Africa(Johannesburg)Kuwait, Qatar, and Malaysia. You can know more about EIL from its About us page. Trainee Supervisor: Civil-2, Mechanical-4, Construction (Safety)-4. Total: 10. Max. 25 years as on 01.06.2012. Age Relaxation: 5 years for SC/ST candidates, 10 years for PD & 3 yrs for OBC (non creamy layer). Academic qualifications should be from a recognized institute/university. Stipend of Rs. 7,500/- p.m. in the 1st year & Rs. 11,000/- p.m. in the 2nd year. After the successful completion of the 2-year training period, the Diploma Trainee's would be absorbed as Jr. Draftsman Gr-II/Supervisor Grade-II in the pay scale of Rs. 11900-32000/- with a basic pay of Rs. 11900/- (Level-5). EIL Diploma Trainee would be selected through skill test and / or interview. You can apply for the EIL Diploma Trainee positions only online. How to apply for the EIL Diploma Trainee/ Engineer positions has been described very clearly in section:" GENERAL INSTRUCTIONS" in page 6 of the notification. You would be able to find the post-specific Online Form for EIL Diploma Trainee recruitment 2012 in this EIL career/recruitment webpage in section "RECRUITMENT OF FRESH DIPLOMA HOLDERS (Adv No:HRD/RECTT/ADVT/2012-13/01)" In this page, click on the serial number corresponding to the post for which you want to apply. For example, for the post "TRAINEE DRAFTSMAN (CIVIL)", click on "1" as shown highlighted in the illustration above to find the online application form. Hope with above you can apply confidently for the EIL Diploma Trainee/ Engineer positions. Although this information is posted for the Diploma Trainee aspirants of EIL recruitment 2012, the eligibility and the application process for Diploma Trainee positions has remained same for last many years. And hence these info can be used to know for future EIL recruitments also - say EIL Diploma Trainee Recruitment 2013 Eligibility & Forms.